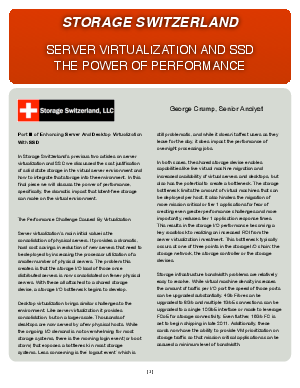 In the previous two articles on server virtualization and SSD Storage Switzerland discussed the cost justification of solid state storage in the virtual server environment and how to integrate that storage into the environment. This final piece focuses on the power of performance, specifically, the dramatic impact that latent-free storage can make on the virtual environment. Read on to find out more!